With or without salt, you need a small-batch recipe for caramel in your life. You already know everything that it wants to be poured on–ice cream, cupcake frosting, whipped cream, your spoon. Heck, even your morning coffee is staring longingly in the direction of the jar. 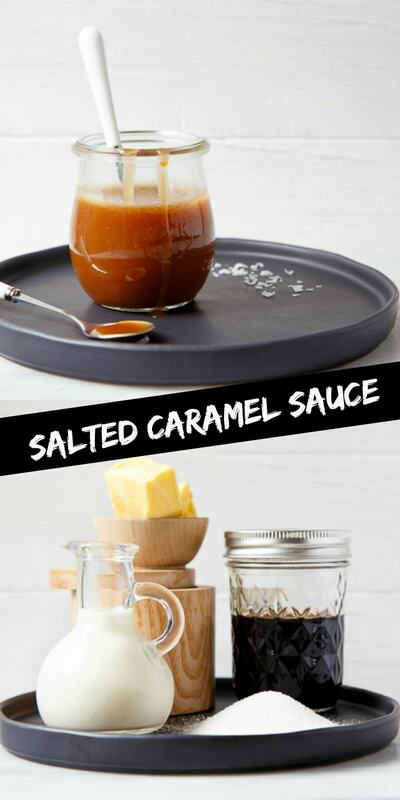 I used to be intimidated by homemade caramel sauce, and so I would buy it pre-made from the store. Then, I read the ingredient list on that stuff. Um, no thanks. I vowed to figure it out on my own. How hard could it be?–just sugar, water, cream, butter, and vanilla. I always have all of those things in my fridge, so I needed to figure it out. How great would life be if caramel sauce was always within reach? Answer: SO great. Before I figured out a handy little caramel trick, I made it quite a few times and ended up with lumps. (Delicious little lumps that I ate out with a spoon when the mixture cooled, but so not the goal). Every recipe states that if you have lumps, just put the mixture back on the stove and stir until they melt. The problem with that is that the caramel keeps cooking, and the longer you cook caramel, the closer it gets to the temperature where it turns hard. I wanted soft, supple, pourable caramel. (All I’ve ever asked for in life). I made homemade caramels in cooking school once (at the now-closed Tante Marie, sniff, sniff), and they were the soft, chewy caramels that you make around the holidays. I actually have a small batch recipe for homemade caramels. But again, I was looking for pour-ability. Drizzle-ability. Drink-ability. My tip is to warm the cream before pouring it into the molten sugar and water. When the cream is hot, the temperature gap is bridged slightly and lumps are less likely to form. Revolutionary, right? I know. I try. I actually got this little nugget of advice from the new book Ice Box Cakes. And after we make this batch of salty caramel, we’re going to make an ice box cake with it. Stay tuned, friends! In a deep saucepan (at least 2 quarts--no smaller, because the mixture bubbles up! ), add the sugar and water. Whisk to combine. Turn the heat to medium-high and let the sugar melt and dissolve without stirring. If you see sugar crystals on the sides of the pan, use a pastry brush dipped in water to gently push them back in the pan. Do not stir. Once the sugar is dissolved, crank the heat to high and watch it turn an amber color. Watch it closely, it happens quickly! You can swirl the pan gently to evenly brown the caramel. Meanwhile, heat the heavy cream until it's steaming, and small bubbles are forming around the edges. Turn off the heat to the sugar mixture, and add the heavy cream all at once. Be careful--it bubbles up triple the size! It is very hot! Next, whisk in the butter, salt and vanilla. Whisk until smooth. Pour the mixture into a jar to cool and use as you like. 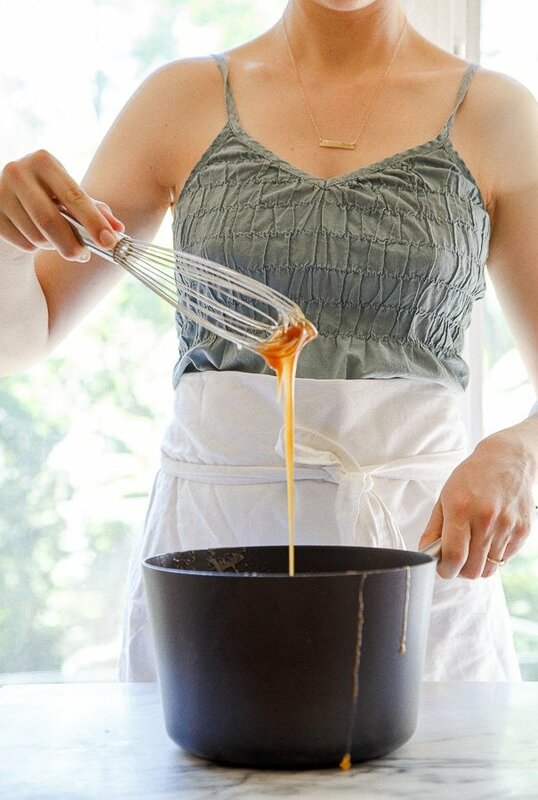 I’ve had it on my list for a while to make a vegan caramel sauce, so I think your warming tip might be just the ticket : ) Love the pictures pretty lady! A small batch means that it’s perfectly ok to eat all by myself once i’ve made this. :) Love the tip to warm the cream. I’d like to keep this in my fridge at all times for impromptu ice cream sundaes. How did you know this is exactly what I needed this Monday morning? Can’t wait to make it! Question: any suggestions on a temperature to heat the cream to? I’m assuming don’t boil it so it won’t get a skin or anything like that, but to a simmer? Or a certain degree? Hi Lizy! Ack! I definitely should have included that! Sorry! Updating now…. What about doubling this recipe for those of us who may eat / test taste more than a spoonful!? Go ahead, Mary Ann. The world is your oyster! Cutest little top – ever!! And I love the gray. I say that there’s no such thing as regular caramel anymore. Salted is the only way to go. I just made this. It is damn delicious. I made white chocolate pana cotta which is setting in the fridge. I am going to serve them tonight with a little jug of the caramel sauce for a truly artery hardening delightful pud. Thank you so much. Hi Christina! I am with you plus a little more on the fear of caramel, the thought of intentionally burning something keeps me awake at night :( This looks delicious, though, and the fact that it’s small batch guarantees that if it fails, I can eat the delicious mess before anybody gets home to judge me. I might just have to make this sometime! 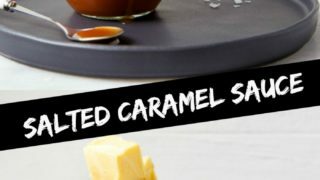 Hi, I haven’t seen any recipes for caramel sauce that use water and I was curious what it does for the recipe? I’m a little worried about the effect. My Carmel is super liquidy!? What went wrong?? Hmm…that’s never happened to me. I’m guessing it didn’t boil hard enough or for long enough. It sounds like it didn’t reduce and thicken? Are you up for trying again? I promise I’ve made this recipe at least a dozen times and it always works :/ Did you do any substitutions? Did you use HEAVY cream? Hi! I’ve made this caramel sauce many times, and it’s always delicious. but for batches I don’t scarf down in one sitting, the sauce gets grainy after a few days. is there any way to prevent the graininess, besides eat it faster :) or is it just something sugar/caramel does? thanks! Hi Loretta! This happened to me last week with this sauce! I normally eat it the same day it’s made, but we had some leftovers. I warmed it back up with another splash of cream. It kinda helped. Sorry! Wish I could help more. If you mix it with cream cheese it makes a great frosting for anything, especially a pecan banana cake. The graininess that might develop disappears. Delicious! I think I let my sugar go a little too long, my sauce is not pourable. The fastest, simplest carmel recipe I’ve made.